Solidarity Credit Union has two branches in Indiana and thousands of free ATMs nationwide through its CO-OP and Alliance One networks. It offers business savings and checking accounts, merchant processing, payroll services, employee benefits programs, and insurance. We searched for Solidarity Credit Union reviews and found that it has a B- rating from the BBB. You may join Solidarity if you are a family member of an existing Solidarity member, or if you live, work, worship, volunteer, or attend school in Howard County, Tipton County, Peru, Logansport, and Grissom AFB & Metroplex. Ready to get started with Solidarity Credit Union business checking? Apply now. 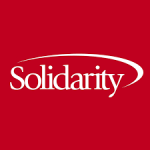 Solidarity Community Union has two branches located in Kokomo, Indiana. It is also part of the CO-OP and Alliance One networks, which provides its members access to thousands of shared branches and surcharge-free ATMs nationwide. You may view its contact us page to check which location is closer to you. Solidarity Community Union also offers business savings and checking accounts, and credit cards. Although it offers personal and other types of loan programs, it currently does not offer business loans. Find out more about its small business offerings on its website. Want to know which bank we named the best business checking account for small businesses? Read our business checking account buyer’s guide comparing the top options.